Introductory school balances are perfect for the young scientist. 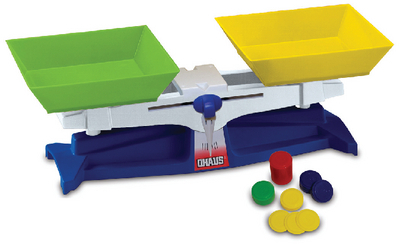 This colorful and durable balance is ideal for introducing younger students to balance weighing. The interchangeable, square pans are easily removable for pouring, cleaning, and storing, and the dual pointers allow for viewing from both sides of the balance. Accessories information: Balance comes with 18-piece plastic stackable mass set, including one 1 g, four 5 g, two 10 g, and two 25 g weights. Ordering information: Five-year manufacturer's warranty is included with purchase. The balance comes with an 18-piece plastic and stackable mass set including one 1 g, four 5 g, two 10 g, and two 25 g weights. Caution: Caution:Choking Hazard - Small parts. Not for children under 3 years.